In 1656, Kateri Tekakwitha known as “Lily of the Mohawks” was born of an Algonquin mother and Mohawk father in Ossernenon in the Mohawk Valley, now known as Auriesville, New York. Kateri was four years old when the horrible European disease of smallpox devastated her village. Many perished along with Kateri’s parents and younger brother. She survived the deadly disease but her eyesight was greatly affected and her face ravaged with smallpox scars. Because of Kateri’s near blindness, she held her hands in front of her to feel her way along and protect herself from injury. It was from this characteristic she was renamed Tekakwitha or “She moves things”. In 1667, 11 year old Kateri Tekakwitha meets the Jesuit Missionaries in her uncle’s cabin. By this time the village had moved to the north side of the Mohawk River to Caughnawaga, now known as Fonda New York. As a young girl, she helped with the meals, collected berries from the woods, made baskets, did beadwork and strung the wampums. With the coming of the missionaries Kateri found comfort and understanding of her situation in Christianity and began her dialogue with Father James de Lamberville and expressed the ardent desire for Baptism in 1666, and was subsequently baptized in 1676 at the age of 20. 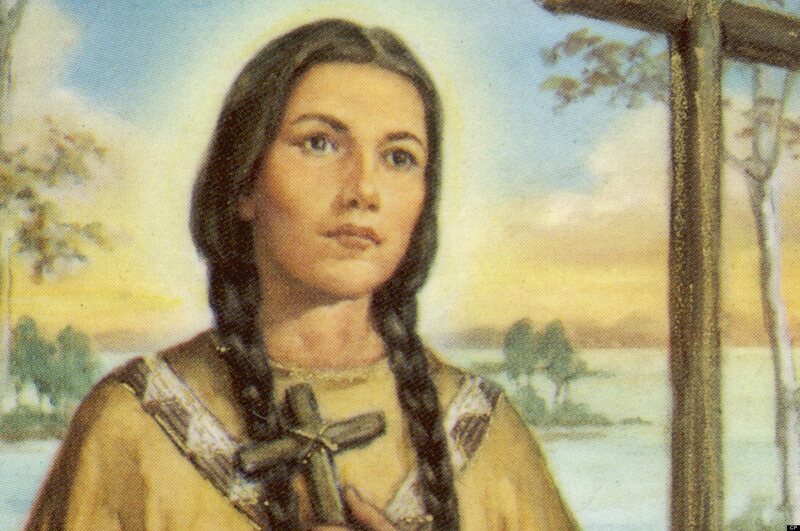 In 1677, Kateri Tekakwitha traveled from the Mohawk valley to the north eastern part of the Territory to the village of Kahnawake and the Mission of Saint Francis Xavier on the shore of the Saint Lawrence River. Father de Lamberville had given her a letter for the Superior of the Mission. The words of this letter were, “ I ask you to please take charge of directing her; it is a treasure which we are giving you. Guard it well and make it bear fruit for the glory of God and the salvation of a soul which is certainly very dear to Him.” A few months after her arrival, she received her First Holy Communion on Christmas Day at the age of 21. In 1680 with her health failing, she became gravely ill and on April 17, 1680, 24 year old Kateri Tekakwitha died. Soon after her death and because of her faith in Christ, her scared face was restored to its former beauty and softness. She was buried in a wooden coffin next to the wooden cross where she prayed on the banks of the great river. The favors and miracles obtained through her intercession began immediately. In 1717, the Mohawks of Kahnawake moved to their final and present day location where Kateri’s remains were housed in a sacred chest of polished wood in the sacristy of the Mission. On Saturday December 6, 1884 the Bishops and Archbishops of the United States of America of the Third Plenary Council of Baltimore addressed the Sovereign Pontiff Leo XIII to institute the process for the beautification of Catherine Tekakwitha. Letters were submitted by various Indian tribes, petitioning the Introduction of the Cause of the Servant of God, Catherine Tekakwitha to the Sovereign Pontiff Leo XIII. In 1931, after years of preparation the cause was instituted by the Most Reverend Bishop of Albany, Edmund Francis Gibbons and in June 1938, the Historical Section of the Congregation of Rites at Rome declared that the documents of the case of Tekakwitha were complete, genuine and trustworthy, that they established Tekakwitha’s renown for holiness, and a solid basis for final judgement that her virtues were heroic. On January 3rd 1943 his Holiness Pope Pius XII offered the Holy Sacrifice of the Mass. Then he solemnly proclaimed: It has been proved in this instance and for the purpose under consideration, that the theological virtues of Faith, Hope, Love of God and Neighbour, and the cardinal virtues, Prudence, Justice, Temperance, Fortitude and subordinate virtues of the Venerable Servant of God, Catherine Tekakwitha, were heroic. Pope Pius XII signed the DECREE in which Catherine Tekakwitha was “Venerable”. In 1980, Kateri Tekakwitha was beatified by Pope John Paul II and declared “BLESSED KATERI TEKAKWITHA”.